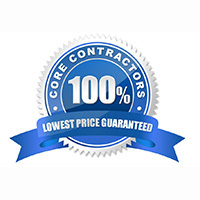 Core Contractors is the only earthquake retrofit contractor Los Angeles and surrounding areas providing guarantees the retrofitting of building costs, cost escalation of any kind related to the seismic retrofit Los Angeles and participating cities, performance of the earthquake retrofit, and completion of soft story retrofit. It all begins with a smart design to meet the requirements of the soft story retrofit program. The engineers of Core Contractors have developed exactly that! Our Project Managers also took to task and value engineered the process of fabrication and installation of moment frames, shear wall framing, cripple walls, and more. We made the seismic retrofitting process most cost efficient. Furthermore, we have standardized and automated the retrofitting of buildings wherever possible. We utilize a Core Contractors proprietary software, programmed with low margin algorithm to capture a greater share of the soft story retrofit market, passed as a low price guarantee and a saving to you. We understand your need to shop for the best price in seismic retrofitting for your soft story retrofit. 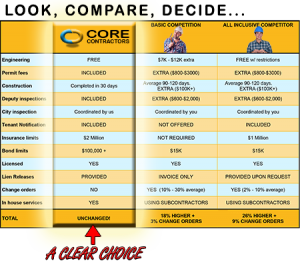 Core Contractors welcomes the competition knowing you’ll recognize the differences in service, knowledge, and cost is unmatched. We suggest you use our comparison sheet and list of prepared questions to aid you in the process of selecting your earthquake retrofit contractors Los Angeles team. We simply ask that you give Core Contractors a last look to offer you a best value in the available seismic retrofitting programs.